The Nestle Peptamen Junior With Prebio Chocolate Flavor Liquid 8oz Each, Model #9871636416, is anchored in advanced science and research. Nestle Healthcare Nutrition offers nutritional solutions for people with specific dietary needs related to illness, disease states or the special challenges of different life stages. 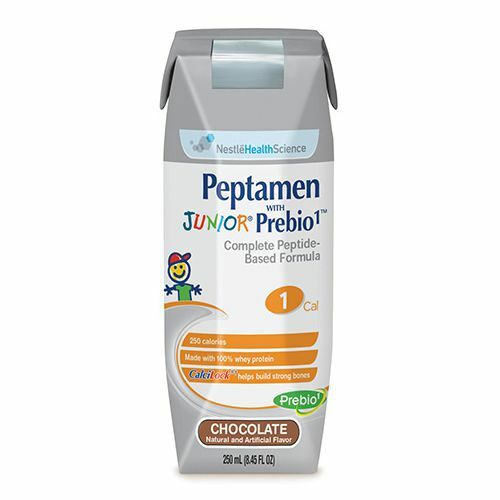 The Nestle Peptamen Junior with Prebio Chocolate Flavor Liquid 8oz Each is a peptide-based, fiber-containing formula with 100% whey protein and helps support nutritional needs of children with impaired GI function. Contains a fiber blend that helps support digestive health. Enzymatically hydrolyzed, 100% whey protein to facilitate gastric emptying. 3.6 g/L Prebio1 soluble fiber blend helps promote the growth of beneficial bacteria to help support digestive health. High MCT to decrease potential for fat malabsorption.